Latin for 'with small fruits'. Light primary and secondary rain forest, forest margins, along rivers, common on hillsides and ridge-tops, also in swampy forest; soil: sandy, sandy loam, lateritic, black, or ultrabasic; altitude 0-500(-1200 m). Wood soft, white, only used locally for building purposes. The strong-smelling pods are reported to be used for seasoning of food in Malaya. Shoots and roots are prescribed against itch. 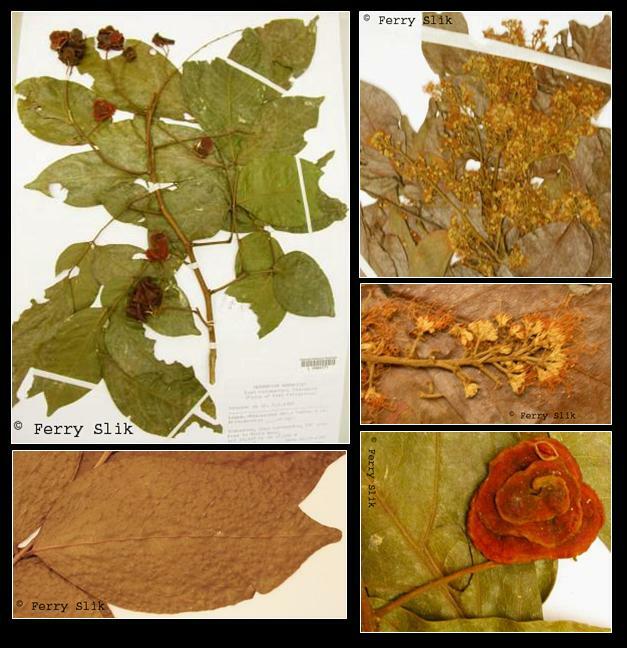 The pounded leaves are used for rubbing the skin of patients suffering from smallpox. Borneo: Balinag, Girik, Jaring burung, Jaring hutan, Jering, Langir hantu, Piling, Tionggong.